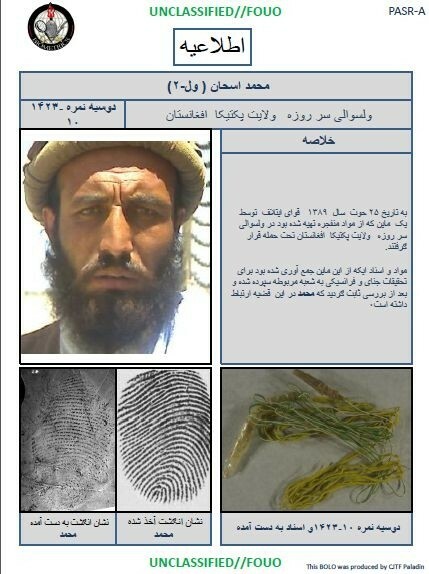 Mohammad Ashan, a mid-level Taliban commander in Paktika province, strolled toward a police checkpoint in the district of Sar Howza with a wanted poster bearing his own face. He demanded the finder’s fee referenced on the poster: $100. Afghan officials, perplexed by the man’s misguided motives, arrested him on the spot. Ashan is suspected of plotting at least two attacks on Afghan security forces. His misdeeds prompted officials to plaster the district with hundreds of so-called “Be on the Lookout” posters emblazoned with his name and likeness. When U.S. troops went to confirm that Ashan had in fact come forward to claim the finder’s fee, they were initially incredulous. “We asked him, ‘Is this you?’ Mohammad Ashan answered with an incredible amount of enthusiasm, ‘Yes, yes, that’s me! Can I get my award now?’” recalled SPC Matthew Baker. A biometric scan confirmed that the man in Afghan custody was the insurgent they had been looking for. “This guy is the Taliban equivalent of the ‘Home Alone” burglars,” one U.S. official said. Wanted posters are often distributed by NATO forces, but rarely have such a direct impact on the apprehension of an insurgent. In restive Paktika province, civilians are typically afraid to pass on intelligence that might lead to an arrest. And insurgents tend to shy away from the urban centers where they’re being hunted, particularly while carrying evidence of their own transgressions. Officials have guessed at what the unusual details of Ashan’s arrest might tell us about the state of the insurgency — its desperation, its lack of resources, its defiance of law and order. But, for now, the consensus has landed on the singularity of Ashan’s act, and the intellectual calculus that led to it.